What happens if a speckled gray pigeon is trapped and spray-painted in a miniature car wash, released as a colorful bird, and then streaks through public space? The art project initiated by Julian Charrière and Julius von Bismarck was first performed at the Venice Architecture Biennial and examines processes of perception in a playful yet conceptual manner. Viewers are forced to reflect on and re-invent their environment as well as the urban space, the pigeons acting as catalysts for the destabilization of observation. For the book Some Pigeons Are More Equal Than Others, poets, philosophers and thinkers were confronted with portraits of the vibrantly colored birds and asked to enter into a fictional dialogue with the creatures. The result is an anthology of poetry and prose, creative writing and ideas – an urban manifesto evolving ideas on the role of public domains and the encounter with contemporary art today. 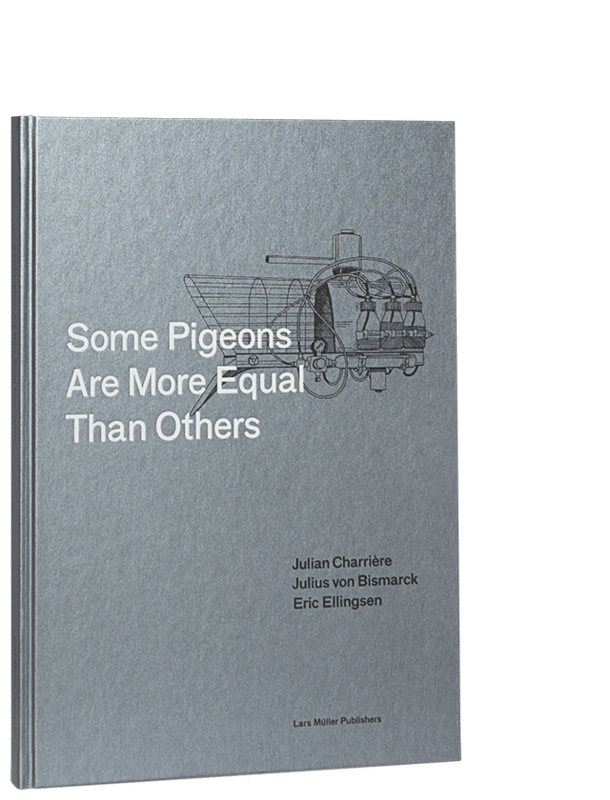 The glossy photographs of the pigeons are accompanied by notes, essays and illustrations as well as interviews and conversations among artists such as Ai Weiwei and Olafur Eliasson. With contributions by Ben Marcus, CA Conrad, Craig Dworkin, Lyn Hejinian, Marjorie Welish, Juliana Spahr, Ian Bogost, David Graham Burnett, Claudia Roden, Olafur Eliasson u.a.